MIT School of Engineering | » Is there a way to harness electricity from lightning? Home>>Connect>>Ask an Engineer>>Is there a way to harness electricity from lightning? “Benjamin Franklin was really lucky his kite wasn’t struck by lightning,” says James Kirtley, MIT professor of electrical engineering and a specialist in electric machinery and power systems. 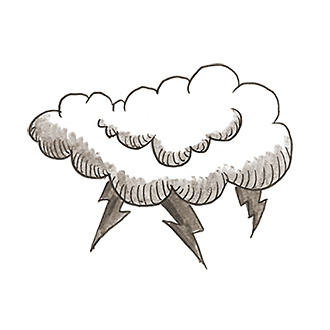 The average lightning strike contains about 1 million joules, enough energy to fry the founding father in his boots. “The typical house in the U.S. has 100 amp service or about 28 horsepower,” says Kirtley. Unfortunately, relying on lightning bolts to power our hair dryers, TVs, and refrigerators would be far from cost effective. The problem is that the energy in lightning is contained in a very short period of time, only a few microseconds. Further, to obtain that 1 million joules, one would have to handle a voltage of several million volts. Absorbing lightning and converting it to useful energy would be an extraordinary challenge, Kirtley explains. It would require complex capture and storage facilities and distribution systems that in the end would unlikely yield enough energy to justify their expense. To start with, attracting a lightning bolt would take much more sophisticated equipment than an iron key at the end of a silk string. Tall metallic rods extending high above the ground would do the trick, drawing any electrical charges in the atmosphere and directing them into a facility. But robust and dependable safety mechanisms would also need to be built to immediately contain the huge burst of energy and prevent the entire facility from being blown to bits. And because you never know if an upcoming lightning strike is going to carry a positive or negative charge, capacitors and rectifiers would also be necessary to equalize the currents of incoming strikes. “You’d need some sort of mechanism to make sure the positive charge of one bolt didn’t cancel out the negative charge of another,” Kirtley explains. In addition, determining the most practical locations for capture facilities would present a huge host of problems. According to the National Oceanic and Atmospheric Administration, lightning strikes somewhere on the earth approximately 44 times every second, but most of those strikes occur in the tropics and remote mountain regions. Constructing a state-of-the-art energy conversion and storage facility in such conditions would be enormously difficult. Distributing that energy to more populous areas would add even more logistic and economic challenges. Thanks to Dylan of Cape Town, South Africa, for this question.